No pics of the cute kiddos. :/ But I just got back from the kinder PTA presentation and they were adorable. And then choir did awesomely, even though they were sweating up there under the lights with no AC even more than we were in the audience. I heart my new bulletin board. Already know some things I would change but I'm thinking of doing a whole reading promotion (I SO didn't come up with the idea) next year. I actually already made one change and added "all summer." "iRead all summer." 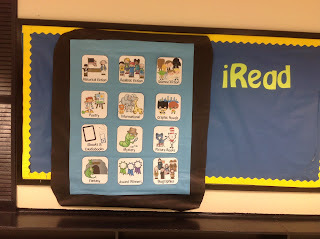 Thinking of adding the "apps" onto a clip art iPad and saving them all as one image ... and then trying Thinglink and adding links to websites or book trailers or something that relates to each genre. Maybe. And now I see there is no home button. And it's crooked. Oh well. I still like it. Today? Two point five hours of thumping bass, maracas, jingle bells, and screaming kids (appreciating each teacher on a red carpet after picking up classes from lunch) in the 590 section plus sounds of a bird coming from the office plus drills and workers fixing a broken door plus horrendously painful "cute shoes" (and they were FLATS!) = at least the kinders and choir did well tonight and I am so glad to be home! Now to go read a book. Or shop on TPT. We'll see which one wins.